ghd Gold Series Outshines everyone with the sleekest ever stylers. Luxurious plates smooth your hair for an ultra-shiny result. Our new golden plates are contoured and have a high-gloss finish to glide through hair effortlessly. 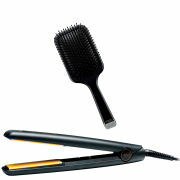 The ghd Gold Series stylers stay cooler to touch for longer and are lighter to handle. Sleek design: allows for better handling for all types of styling. Protective plate guard: to safely cover hot plates when you need to style and go. 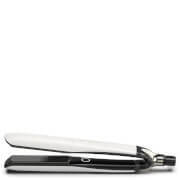 Ceramic heaters and contoured plates: glide through your hair for smoother, snag-free styling. Rounded barrel: easily create curls, waves, flicks and the perfect straight. Sleep mode: heaters automatically switch off if not used for 30 minutes. Universal voltage: optimum performance wherever you travel. Ideal for styling thick hair and creating larger curls. UK three pin plug only. This ghd comes with a 2 year warranty. Faults: Please contact ghd on: 0845 330 1133. Please note: This ghd styler comes with a UK three pin plug only. After reading both good and bad reviews for the GHD Gold Max styler I was undecided whether to try it or stick with the original which I had used for the last 9 years. I have long, fine hair and lots of it and with a strong natural wave. The original ghd styler worked well but it does take about 25 minutes to straighten all of my hair. Also I have some arthritis in my hands and it can get quite painful using it for that amount of time. In the end I decided to try the Gold Max Styler and am very pleased that I did. It is so smooth that it glides very easily through my hair. I still have to go over each section several times because of the waves that I have but now I can fit more hair in. I would say that it has halved the time it takes and it is a pleasure to use. Now I don´t dread straightening my hair anymore! I've bought a gold max: I had a good styler alreadyand I feared discover that the ghd was almost the same, but noooo! : it is completely another quality: my hair are soft and I can smooth them very quickly. I didn't know if buying the classic styler or the max versiona and I decided after watching a spanish review: ihf your need is smoothing hair and you have a lot o long hair with the gold max you will do it easily and quickly. I have long, super thick and naturally very wavy hair. Straightening with the standard GHD styler works but takes time. These do a decent job on my hair in 10 minutes and in 15 minutes it's pretty much poker straight. I would highly recommend for those with thick luscious locks! Love these ghd Gold Max Styler, I have long frizzy hair and they are amazing it is now very quick an easy for me to straighten all my hair. Highly recommend. I purchased this ghd Gold Max Styler a couple of weeks ago and so pleased I did - it replaced my old GHD which I purchased from this website which lasted 5 years so think I got the mileage out of it! - it only took one week to get to NZ and this GHD is lighter and quicker to heat up - I love it and would recommend to anyone - if you are wondering if you should stick with GHD as I was, do it - it is the one and only way to go with hair straighteners. Highly recommend. I thought I'd better treat myself to some new GHD's seen as my old ones are about 17 years old ! These are much lighter than old GHD's. Slightly smaller size on actual plate compared to old ones but still do the job as my hair is quite thick and I don't have much time to straighten hair. Great to have beep to let me know when GHD's are hot enough to use. Think the self turn off button is fantastic as it'll give peace of mind. 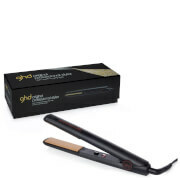 My order of this ghd Gold Max Styler was dispatched the next day and arrived in Greece within 5days. Excellent service from HQ Hair once again. The ghd Gold Max Styler was purchased as a Christmas gift for my granddaughter. It was on her "wish list", and I'm hoping it will be the 5 stars I have given it.